I was given these products to review, but all opinions are my own - as always! What? You don't dress to match your bath products too? My whole life I have had oily skin, especially as a teenager. I hated having a shiny face and oily hair, so naturally I always chose oil free beauty products. If there was an oil free option, I was on it! My make up bag was full of blotting tissues and powder, and I was super embarrassed about it. Thankfully my skin has evened out a bit now that I'm a bit older, and in the winter it even gets dry. My hair has gotten less oily too, but because I color it and also heat style it daily, it's always feeling a bit dried out as well. 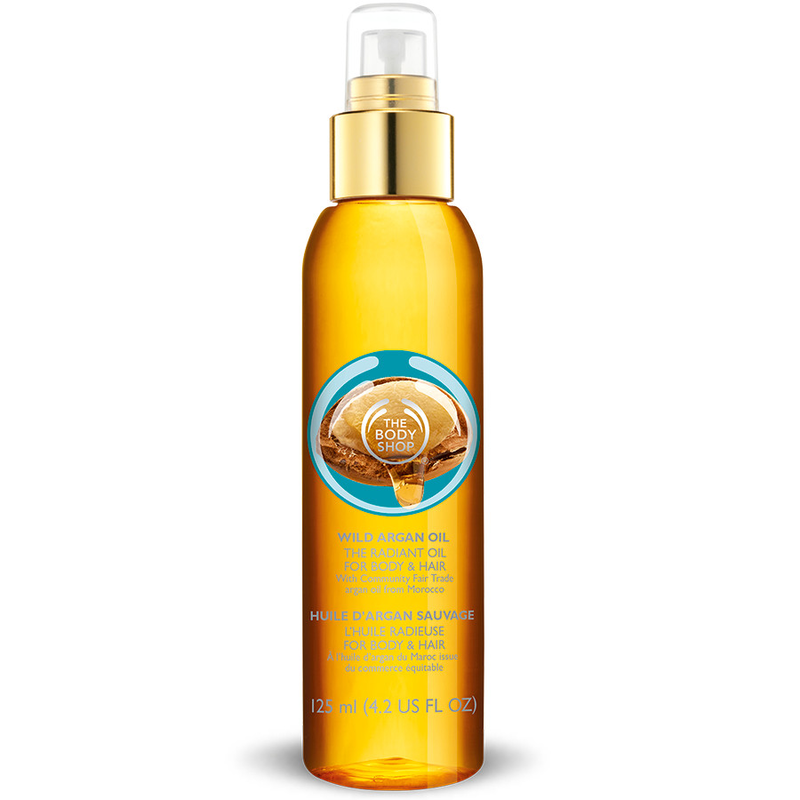 When The Body Shop offered to send me their new Wild Argan Oil line, the teenager in me almost said no, but I said yes, and ended up being pleasantly surprised. The Wild Argan Oil line has a very mild smell (smell is important! ), and it's obviously not flowery or fruity. It's hard to describe, but it's nice. It was too much for my nose when I tried to use the shower gel and the scrub and the lotion and the lip balm all at once, but one at a time they smell good. But I'm sure your most pressing question is how oily the products are, and I can happily report that they are not. Despite having oil in the name, none of them were oily except for the Radiant Oil for Hair and Body, but that one was my favorite over all. The body wash, the bubble bath, and the lotions just left your skin feeling moisturized afterwards. There was no greasy feeling to them. One of my unexpected favorites was the massage soap. One side of it is shaped as knobby massagers and it feels really cool. My kids and I both loved using it. Oh, that all soap was shaped this way! Another favorite was the Wild Argan Oil Rough Scrub. It feels just like the scrub they use when you get a mani or a pedi, but you can do it at home any time! It really scrubbed the rough skin and then left my skin moisturized too! My very favorite was The Radiant Oil for Body and Hair. My favorite way to use it was to apply it to wet hair after showering and then sleep on it. It moisturized my hair all night long and when I woke up it was so, so soft. I also like using it in smaller quantities before I blow dry my hair or on my skin after I shower. This stuff was amazing. Overall, these items were a win for me. I tried something with oil in it and came out the better for it! If you want to try any of them (you do! 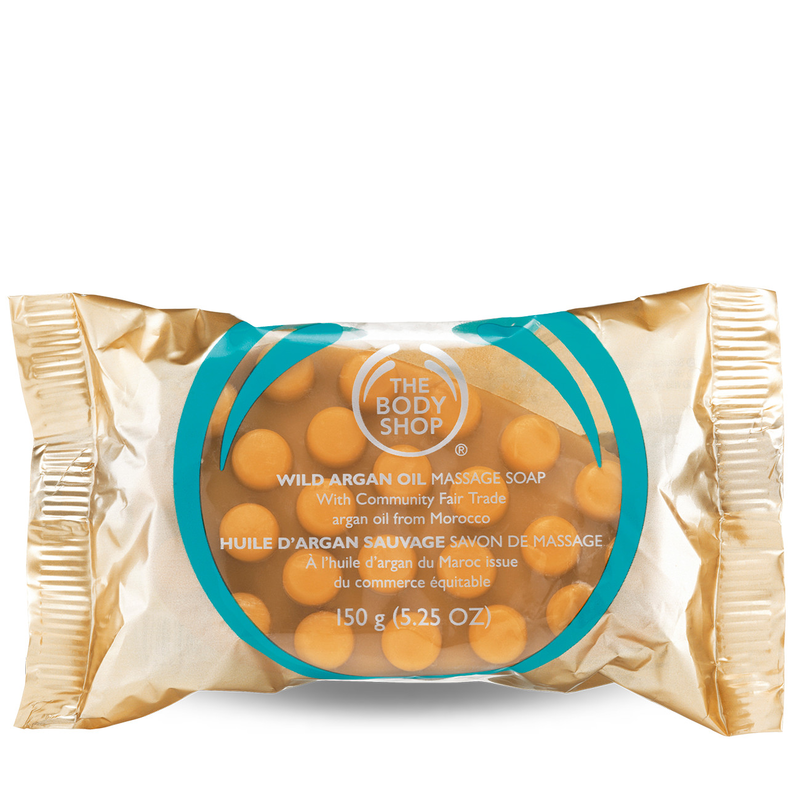 ), you can get free shipping with any purchase of the Wild Argan Oil collection. Do you love The Body Shop too? Which of their products are your favorite?? OMG I love that you have a matching shirt! ha! I have been into oils lately, too. They really aren't as greasy as you'd think, huh? I'll have to try this hair oil and the scrub. Thanks! Recently I've been using Argan Oil on my hair, but in small amounts, mostly the ends. When you do the overnight treatment, do you sleep on a towel or normal pillowcase? I definitely sleep on a towel when I really douse it. Or switch to an old pillowcase. Unrelated... are those your real nails?? They look so good! Oh I lovee this scrub... I'm planning to buy the oil too... a little skeptical... can the oil replace the moisturizer i use after bath?